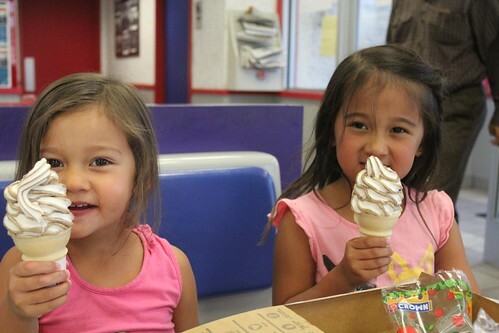 Mali Mish - Day 39: Catch up with life in Clear Lake. Day 39: Catch up with life in Clear Lake. Today we are once again going to stay put at our campground. Four full days of travel kind of kicked us in the you-know-what. So we are going to do our best to avoid getting in our van today. Challenge accepted! 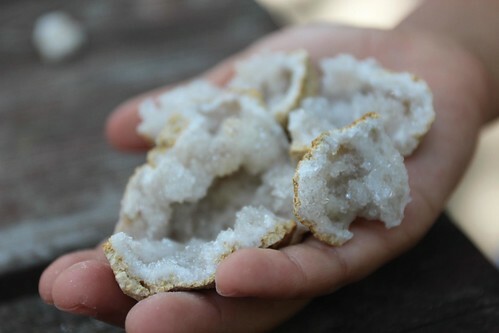 We started off our day with a little homeschooling lesson about geodes. Back at the museum in Deadwood, we bought some geodes for the girls and they have been begging for us to crack them open ever since the gift shop lady handed us the receipt. Not at all annoying, kids. Not. At. All. 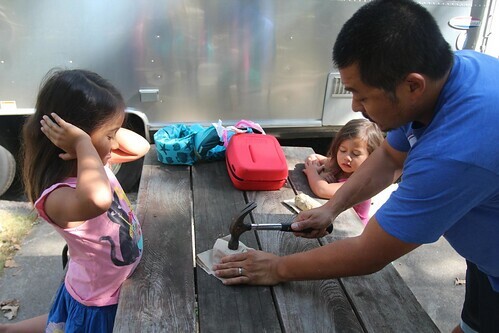 So Dan got to bust out his hammer and break some rocks for his little ladies. But he couldn’t break Ava’s geode. He hit that rock a million times and still nothing. Barely a dent. 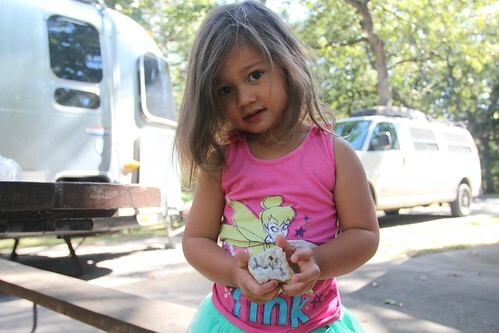 I guess we bought Ava a solid piece of crystal instead instead of a geode. She was not amused. So he got to try it again with Mila’s geode. After one whack with the hammer, the geode exploded and whamo! We had crystals!! Don’t worry. Ava wasn’t too sad. Here little sister had more than enough pieces to share. Then we moved the party back inside. Ava and I continued on with some math and reading homeschooling. Dan busted out 4 blog posts in one day and something called work. 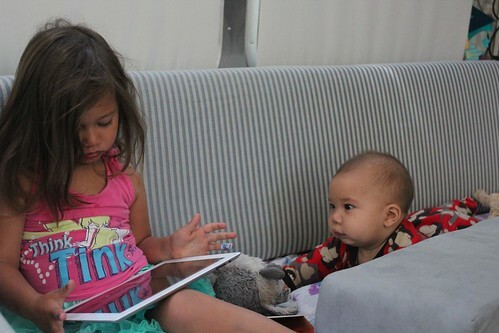 Mila continued to master all things iPad related. And Luka wondered when that fist tooth that has been bothering him will ever pop out. 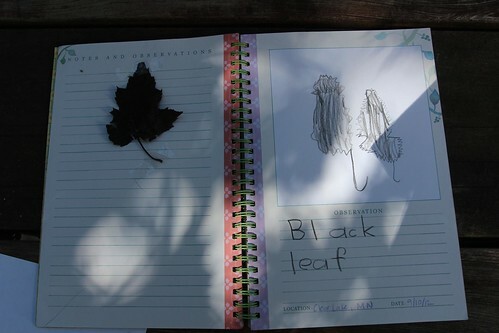 I also started a nature journal with Ava today. Not sure if we are supposed to save the specimen or not, but we did. 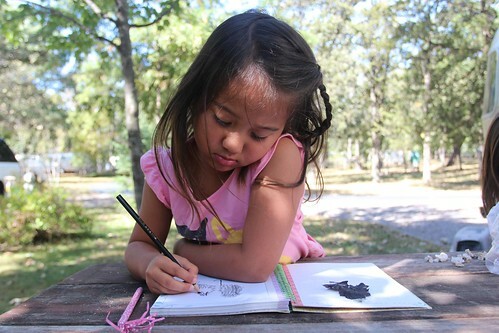 We taped a leaf into her notebook. Now that I am thinking about it, it will probably ended up in a million little pieces by the end of the trip. This one is titled “Black leaf”. How many points do we get for originality? In the afternoon, I walked with the kids to the pool… and it was nice and empty. 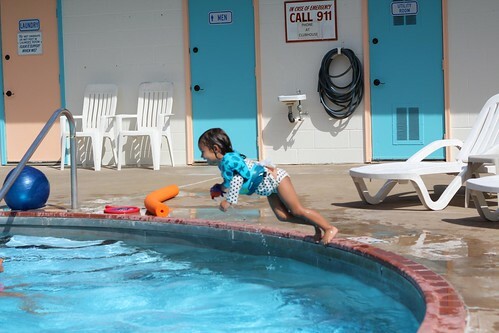 The kids had a blast with the pool toys that the provide to their guests. 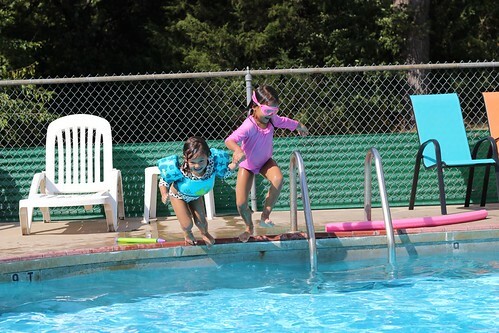 …they get to jump at the same time. WEEEEE! And you know that challenge of not getting into the van today? Yeah, we totally failed. 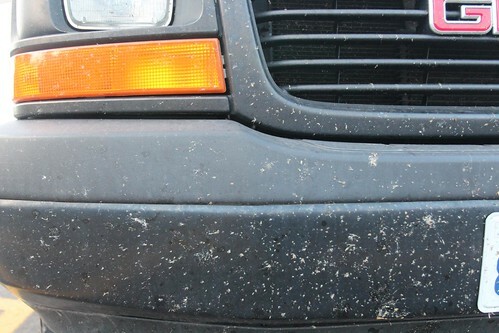 And speaking of the van… this is what 3,000 miles of driving looks like. SO GROSS!! Sorry little (and not so little) bugs! Day 38: Chillaxing at the Minnesota Airstream Park. 2 Responses to Day 39: Catch up with life in Clear Lake. □ Lay out a paper bag or folded paper towel on an ironing board or other solid heat resistant surface. □ Place a sheet of waxed paper on the paper bag. □ Place a leaf onto the wax paper. □ Cover the leaf with a second sheet of wax paper. □ Layer that with another paper bag or folded paper towel. □ Press on the paper towel or paper bag with a very warm iron (no steam) to seal the wax sheets together. □ When it is cool enough to handle, cut around the leaf, leaving a margin of wax paper “seal”. □ You can then tape or glue the wax sealed leaves to paper & label them or put them in a sheet protector & 3 ring binder. Ooooh, that is a much better plan for our nature book! Thanks, Eleanor 🙂 I’m going to do that next time for sure. I knew I brought my iron for some reason! !